If you do not use pork, replace pork with the same amount of boneless skinless chicken thighs that have been trimmed of extra fat. If you don't eat pork, replace pork roast with boneless, skinless chicken thighs. In 4½- to 6-quart slow-cooker pot, stir onion, ketchup, vinegar, brown sugar, tomato paste, paprika, Worcestershire, mustard, garlic, and pepper until mixed well. Add pork to sauce mixture turning to coat well with sauce. Cover slow cooker with lid and cook on low setting, 8 to 10 hours or until pork is very tender. Transfer pork to large bowl or rimmed platter. Pour juices from the slow cooker into a saucepan. Heat sauce on medium-high heat until boiling. Stirring often, allow sauce to reduce slightly and thicken. While sauce boils, pull pork into shreds with 2 forks discarding any fat that needs to be removed. 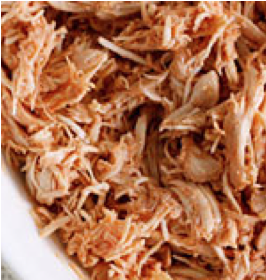 Return shredded pork to slow cooker and toss with thickened sauce to combine. Allow to cool. Package in freezer bags, remove as much air as possible, seal, label and freeze. To serve: Thaw. Warm until heated through. Spoon pork mixture onto baked sweet potatoes or the bottom of gluten free sandwich buns (like Noah’s rolls); replace tops of buns. Serve sandwiches with pickles, potato chips, and gluten free hot sauce if you like. This is absolutely delicious! I found that it was great on Sunday night when I made it, but that it was even better two days later. (We did freeze one portion size). This is definitely something that can be made ahead and definitely something that we will make again in the future. Do you think it would taste okay by just leaving out mustard? My son can't have mustard & I can't think of a substitute.